I enjoyed re-visiting the panel discussion on Civil War blogging from this summer’s Civil War Institute at Gettysburg College. A number of interesting issues were discussed including the question of whether Keith Harris, Brooks Simpson, and me occupy a position of authority in the blogosphere and whether that position comes with certain expectations about the kinds of issues discussed and who should be allowed to participate. Peter Carmichael did a good job moderating this discussion and I appreciate his pushing this issue of authority, but his questions and comments point to the gulf between how the three of us see our blogging and an apparent lack of comfort with the range of subjects and voices that are embraced outside traditional channels. We did our best to communicate our approach, but it is very difficult to do unless you’ve experienced the challenges and dynamics of blogging for yourself. If I understand him, Pete seems to think that our respective credentials ought to translate into a privileged place in the blogosphere. That is not an unreasonable assumption when looking at the blogosphere from the outside. Professional historians operate under a certain set of rules related to publishing and advancement in the academy that are intended to maintain quality control. I’ve experienced first hand the benefits of peer review as well as feedback on papers presented at academic conferences. The point is that there are, at times, reasons to limit certain voices. To be fair, Pete has spent a good deal of time thinking through the value of blogging for his students and for the history profession. His organization of this panel is evidence enough of this. That said, whether we like it or not traditional academic assumptions of authority simply do not apply in the blogosphere. Sure, a blog can be established in a closed community, but that has never been an attractive option to me. I am very comfortable operating in a community where authority is determined entirely by the user. That’s right, Civil War Memory is no more authoritative than any other social media site. Any authority that my site enjoys comes from each individual’s assessment of its content. Some may find my publishing and teaching record to be a reassuring factor when evaluating the site, but it is just as likely that others will be turned off by it and/or point to something as insignificant as my current place of residence. No one assessment matters more. Again, I am just one voice. That level playing field also gives me the freedom to take seriously everyone else out there. I want the freedom to talk about anything on my mind related to Civil War memory and to comment on anything I happen to come across that remotely relates to the subject at hand. Whether the point-of-view exists on the fringes of our intellectual/cultural landscape is of little significance to me. What matters to me is that they are there. In the end, all of us in the blogosphere are looking for an audience. That audience ultimately rewards you with authority by visiting, commenting, and sharing the site with others. No audience, no authority. Such an environment may not be for everyone, but for me it’s made all the difference. I agree, Kevin. To me, you, Brooks, and Keith are authoritative not because of your academic pedigrees but because of your performance in your blogs. Having said that, I also agree Pete did a great job as moderator. There are a couple changes I would have liked to have seen in the format, but they’re meant as ideas for improvement, not as criticisms. It would be interesting to see another panel in a couple more years. To me, you, Brooks, and Keith are authoritative not because of your academic pedigrees but because of your performance in your blogs. That’s the highest compliment you can pay a blogger. I agree with Brooks’s most recent post that it would have been nice to explore more the possibilities of blogging as opposed to having to defend or explain it. That said, overall I was pleased with the way Pete handled it. First, thanks for the mention during the discussion. I’m honored to be mentioned in that group. That was a nice surprise. I don’t know Peter Carmichael at all, but it does seem that he’s having a hard time getting his head around the leveling effect of social media and blogs. It’s a very rough-and-tumble sort of place where, as you, Keith and Brooks all pointed out, formal academic credentials don’t count for a whole lot. The academy can be a very insular, inward-focused world, where professional historians write for, and interact with, other professional historians and few others. All disciplines suffer from that to some extent; I’ve heard archaeologists joke about their new peer-reviewed journal manuscript being well-received by all six of the people who read it. That’s not far from the truth. Brooks argued it most forcefully — very forcibly, in fact — that when history bloggers do put forward historical research and analysis (what Keith correctly described as “micro-histories”), the standard of scholarship and evidence is no less than it should be for a book or other professional writing. Sure, bloggers engage in less-serious stuff as well — goofy jokes and occasionally yanking someone’s chain intentionally — and lots of opinion writing. But sometimes it’s also serious writing that contributes new knowledge, and that should not be overlooked for the fact that it appears in a blog. The work in question has to be judged on its own merit, not based on whether it appeared first on paper or on a screen, or whether or not the author holds a named chair at a prestigious institution. To Carmichael’s great credit, though, I think he understands the importance of these emerging avenues of discourse, and is doing the right thing by pushing the CWI in that direction, even if he himself is uneasy with all its implications and challenges. It does open one up to some pretty angry vitriol, but there’s nothing really to be gained in the realm of public education by shutting oneself off from it. My pleasure, Andy. You should have been up there with us. I pretty much agree with everything you’ve mentioned here. I do think that Brooks is being a little too hard on Pete in comparing him with other academics who have voiced their opinions about blogs. It should be remembered that the inclusion of a blogging panel at CWI was a significant step in a new direction. It’s safe to say that 80% of the attendees would be quite content with the traditional format. To his credit Pete is trying to push the center in new directions. Like I said Pete is working through ideas about the implications of blogging for scholarship, professional outreach as well as its potential for his students. I agree with Brooks that it can be frustrating having to justify blogging. I’ve said before this train left the station a few years ago. There is no longer a question about the usefulness of blogging in academia. The only question that remains is how you try to utilize it. There are no limits. I don’t think I was too hard on what Peter said. Indeed, I suspect that Peter asked what he asked knowing how I would respond. I’m not comparing him to other academics who have raised questions: I compared his queries to their queries. That Peter chose to have a panel on blogging and that it appeared on C-SPAN points to his position regarding open discussion of such issues, just as my decision to appear on the panel and my responses to his queries reflects how I chose to use the opportunity Peter presented to me to set forth my position on these issues in candid, direct, and even blunt fashion. That should also spark discussion, which is all to the good. As a veteran of the CWI(three appearances between 1996 and 2001), I appreciate what Peter has done and he knows he enjoys my full support. Video pretty interesting.. Hopefully moderator was in devils advocate role.. Lot of topics discussed. In order to comment on a topic by both readers and other bloggers, Suggest a transcript be posted. The moderator addressed a point I wanted to bring up. Students generating blog posts. The blog he mentioned is a new discovery .. Looks like quality posts with footnotes to researched material.. What is missing is feedback.. Questions etc.. from readers have a couple of questions right off the bat.. Getting to the archives doesn’t work on ipad.. Archive by topic does.. Recommend art and photography tag..
Perhaps a learning experience for future .. Assign undergrads a blog task. Perhaps based on a submitted paper. 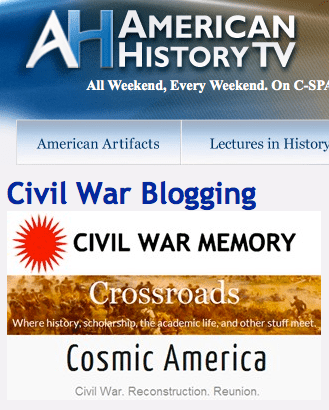 Civil War Memory Posts interesting tasks online for student blogosphere experience ..